In this guide you're going to learn how to lower the alkalinity in your pool (FAST). If your pool water is a little murky or your pool filters seem to be plugged with calcium deposits, then your pool may be suffering from high alkalinity levels. In today's post, you're going to learn all about water alkalinity, what causes your pool alkalinity to get too high, and how to lower it. ​What Is Pool Water Alkalinity? Why Do You Need To Lower Your Alkalinity? 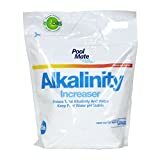 What Causes High Pool Alkalinity? What is pool water alkalinity? High alkalinity is totally curable if you know what to look for. In the swimming pool, it acts as sort of a buffer to stabilize pH levels, which is important to prevent scaling and other pool problems. Pool alkalinity is measured at total alkalinity (TA) and it is simply the amount of alkaline substances in the water. In a swimming pool, the bicarbonate alkalinity is the substance that needs to be regulated. It should be between 80 and 120 ppm (parts per million). An alkalinity level that is too high in a swimming pool can lead to problems such as an imbalanced pH level, which contributes to high calcium levels. High calcium levels can cause scaling, cloudy water and clogged filters. Not to mention, itchy skin and irritated eyes for your swimmers! 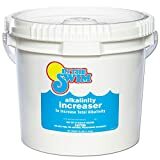 One of the main reasons pool alkalinity can get too high is when you have added too much sodium bicarbonate (baking soda) when you were trying to raise it. Yes, alkalinity that is too low is also a problem, but we will save that discussion for another day! To keep this from happening too often, use smaller increments of the chemical when adjusting alkalinity levels and test the water every 24 hours until it reaches its ideal conditions. Another factor that often causes alkalinity levels to get too high is your water source. Water companies are required to disclose their water testing results to its consumers, so a quick call to the company will help you determine what chemicals you regularly need to keep your water balanced. You should test your pool’s alkalinity levels every time you test your other chemical levels, but if you have noticed some signs of high alkalinity, it’s certainly okay to go ahead and test those levels more often. You most likely have already bought a pool water testing kit and it should contain the reagents necessary to test alkalinity levels. If for some reason, you find yourself without this, you can buy some alkalinity test strips separately. However, strips are not quite as accurate. Once you’ve gotten out your vial and reagent for testing, collect a sample of pool water about 12” below the surface. Then drop the reagents slowly into the water sample and use the manufacturer’s directions to determine your reading. TA levels should always be between 80-120 ppm. There are a few chemicals you can use to lower your pool’s alkalinity level, but muriatic acid is the most common. Turn off your pool’s pump and wait about an hour for the water to stop moving completely. Read the directions on the bottle to determine how much acid needs to be added to your pool in order to lower it to under 120 ppm. Follow the manufacturer’s directions on how to add it to your pool. Muriatic acid is always somewhat diluted, but certain brands require further dilution before adding it to the water. Pour the product into the deepest part of your pool and allow to sit in still water for about an hour. Turn your pool’s pump back on and let it run for at least 5 hours. The problem with unbalanced alkalinity levels is mainly how it affects the pH levels. If your pool’s pH levels are still low (under 7), you may have to use an aeration process along with adding muriatic acid. I only recommend this process in extreme situations where you are unable to lower the pH levels naturally after using the muriatic acid process more than once. Usually, leaving the pool’s pump running on high is enough of an aeration process, but if an extra process is necessary, you can use a compressor at the surface of the water or use a special aerator to insert into the pool. If you attempt this process, do it slowly and carefully as you can also risk over-aerating. Lowering your pool’s alkalinity levels is sometimes a slow process. You may have to repeat the entire process after a few days if the levels have still not dropped to the appropriate reading. You will also want to make sure to test your pH and chlorine levels after a few days so that you can balance them all as needed. Hopefully at this point, your pool’s alkalinity levels are back within normal range, but you might still have a few common questions regarding the process. How do you lower alkalinity without affecting the pool’s pH level? It’s tricky to lower your pool’s alkalinity without in turn lowering the pH levels, but it can be done. Here is a good step-by-step tutorial to follow when this is a concern. Can you swim in a pool with high alkalinity? High alkalinity itself is not necessarily an unsafe swimming condition. In other words, use caution. It’s better to go ahead and stay on top of keeping your pool’s levels balanced than to risk unsafe or unclean water. Can you use baking soda to lower alkalinity? Sodium bicarbonate, aka baking soda, is a chemical you can use to raise your pool’s alkalinity. However, muriatic acid is the best chemical to use in order to lower the alkalinity levels. Low alkalinity is a more common problem than high alkalinity, but either problem can cause an imbalance in your pool’s chemistry. It’s always best to use a good testing kit to test all your pool water levels at least once a week as having any one of the levels off-balance can cause serious issues for your pool and your swimmers. Remember the process of lowering pool water alkalinity may take longer than balancing the other levels. Just be patient and keep testing it! And once your water reaches ideal conditions, do your best to keep it there. Your job will be much simpler in the long run!